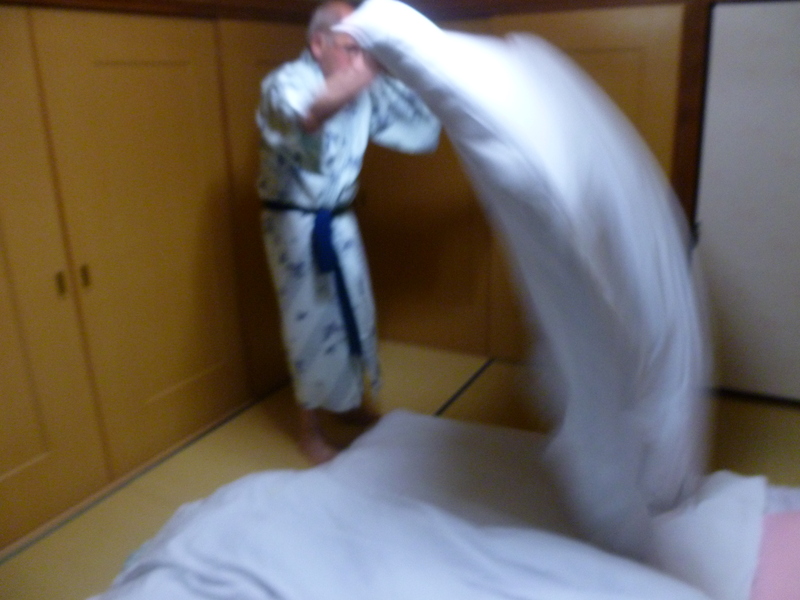 We slept late today only just beating a chambermaid’s knock at the door – check out is ten and it’s now nine-fifteen. Sorry but we needed it. We’re a little late leaving but there’s no discussion of extra charges and it’s all smiles and bows as we depart. 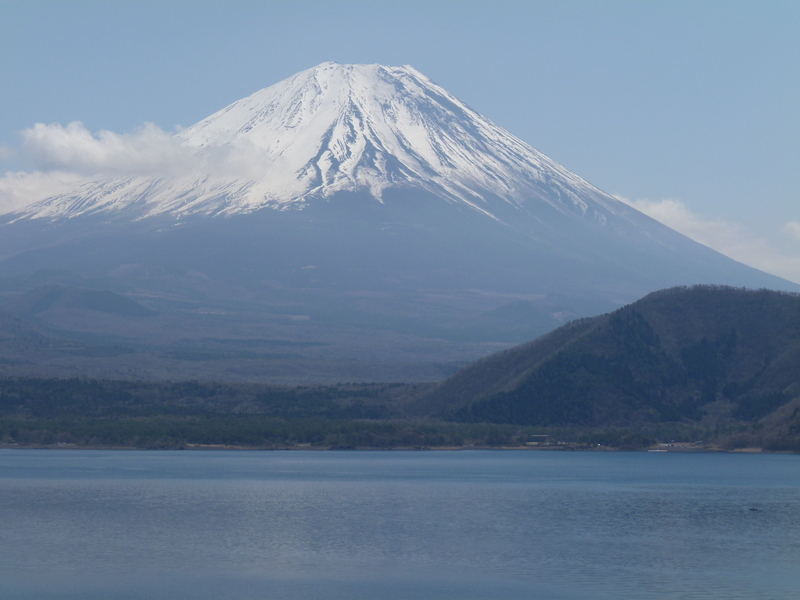 Our plan was to circumnavigate one of the bigger lakes, Lake Motosuko, and find the spot from which Fuji is depicted on the ¥1000 note. It’s a clear, warm, sunny day and being a Saturday tourists are out in full cry. The lake is lovely and we find several spots, including the Treasury’s, from which to admire the clearest waters of the lake and the cloud free beauty of the mountain. Being quite high clouds are always a problem when you are looking for that special image. We then entered the next hotel’s phone number into the SatNav and set off along Route 30 which began with a series of tunnels and then into successive hairpin bends through a pass. 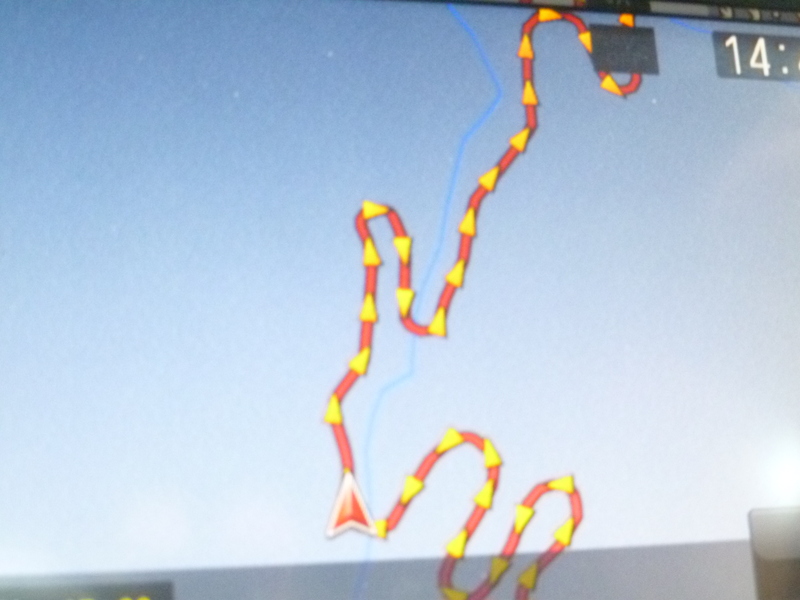 It made our route as displayed on the screen look like a coiled snake. 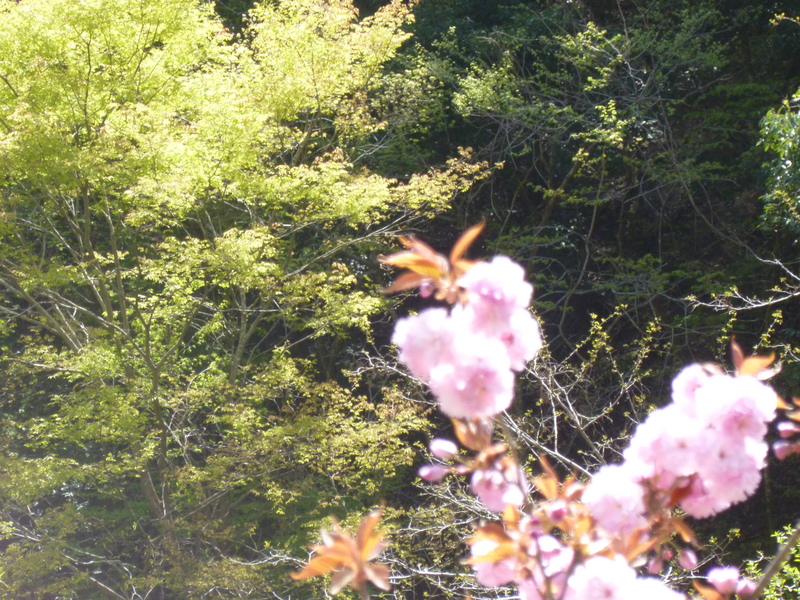 Through a stunning landscape which had conifers mingled with fresh burst leaves of acers in the brightest of greens with candyfloss puffs of cherry blossoms punctuating the view – just gorgeous. We felt very happy to be driving Route 30. It headed towards Nagano with surrounding mountains still well capped with snow and a couple of huge downhill ski runs cascading down the mountains. We then hit the plain, joined the Chuo Expressway again and as usual anywhere in the world the drive was efficient but less fun. With a speed limit of 80 kph on the signs I was glad to see the majority of drivers were as partially sighted as me – Dee didn’t think my excuse “I was going with the flow just keeping up with everybody else” would work in a court of law but luckily I wasn’t called upon to produce it. Off the expressway towards our destination we thought we should fill up the tank as filling stations might not be too numerous in the mountains. I had the phrase ready but when I asked the attendant “Regyuar mandan kudasai” he replied, “Selfo. Press Igris.” The machine burst into life showing grade choices, cash or full tank options and a flashing slot for my credit card. 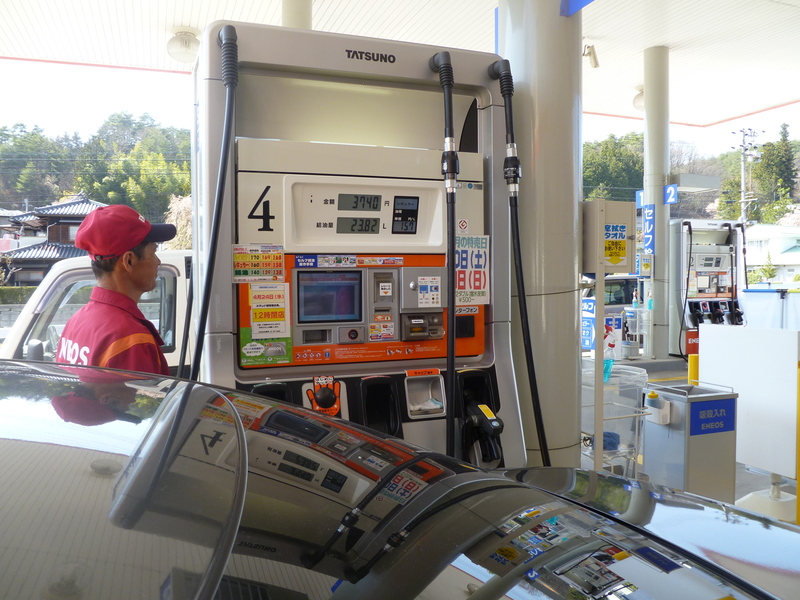 Full tank, all set and they had loos available – much needed after two hours in the car. Easy! Next stage not quite so good. We drive down the Kiso Valley ogling wood craft factories and shops, lacquer ware outlets as we pass but thinking we should find the hotel(?) first and then explore. SatNav lady informed us we had reached our destination as we stopped outside the cemetery at Tsumago one of the famous post towns on the Nakasendo Trail. Well the words Tsumago did occur somewhere in the address but I wasn’t at all sure we were actually staying in this town. There was a shuttered, derelict looking building to our right, two rather lovely cherry blossom trees just coming out nicely but no sign of anywhere we could sleep. We accost a likely looking school boy who gets out his iPhone , switches from Kanji to roman input and gets me to enter the name. The result is unclear but my lightbulb flashes and I go to get the tablet and our router to see if Google maps could help. By this time another tourist group has gathered and suggest we go to the Tourist Information Office who should be able to assist. The whole group guide us down the hill to the office where a lady with enough English summons the innkeeper to come and fetch us. He indicates where we should drive and he will meet us at the bus stop which was marked on the town tourist map. The Shimosagaya Hotel that I’d booked on Agoda was described as Japanese style – but even the town map calls it an inn. 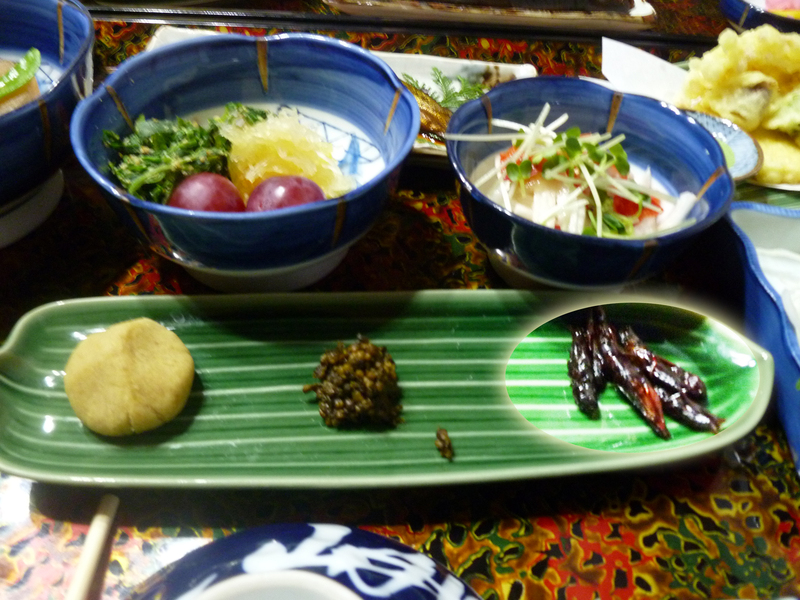 It’s actually a minshuku a family run B&B. We shed our shoes and climb a steep ladder-like staircase that would have taxed Toddy in his heyday but with Dee’s knee and our multiple luggage it’s a struggle. The room we’re shown to however is a delight. 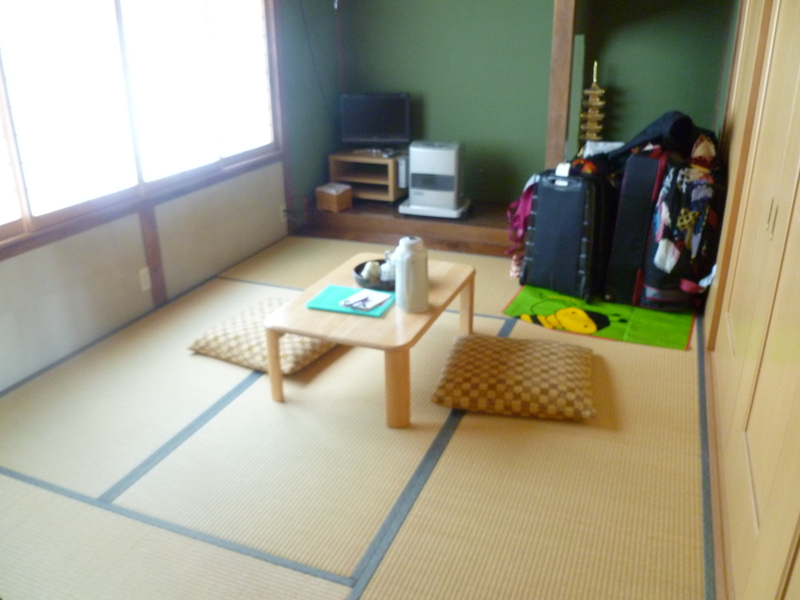 It’s a six mat tatami room with a table, cushions, hot water and tea and some delicious plums provided as a welcome. Oh and the loo has aheated seat an the “toto wash system” built in – use your imagination. Later while we were dining, the table was moved to one side and futons and duvets were put out for us to sleep. We go out to explore this extremely well restored town of Tsumago on the old route from Kyoto to Tokyo. It has loads of wooden houses from the converted into fairly touristy shops with local crafts – some of the wooden objects were glorious. We’d been told dinner was served at six so we had to hurry back to make ourselves presentable to join other guests. As for dinner! Well just look at these before and after pictures. 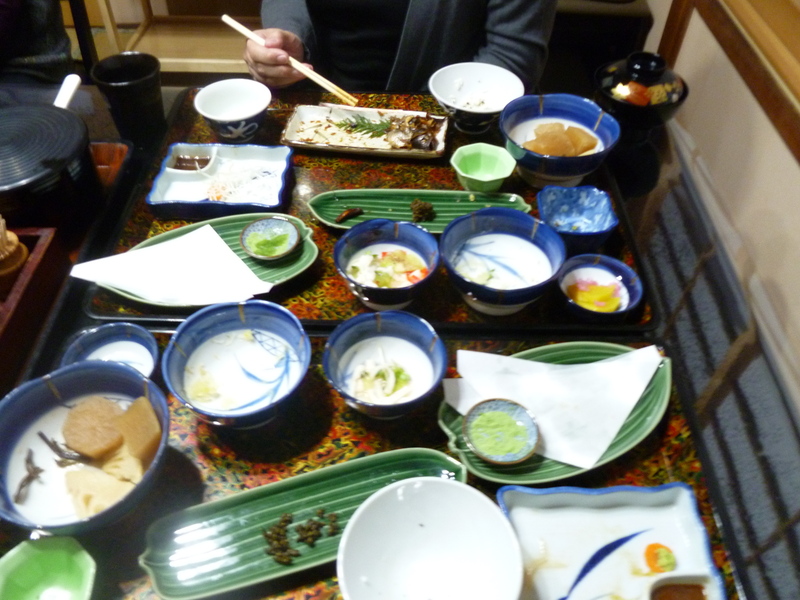 We had virtually no idea what we were eating but apart from a couple of pickled root vegetables we polished it off. 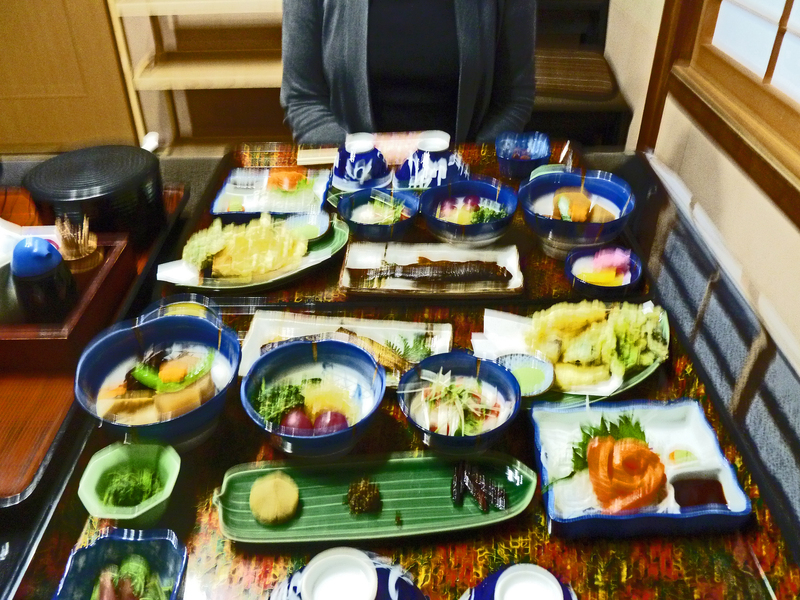 There was one other couple dining alongside us and a few conversational gambits were exchanged including amazement at our itinerary and some notes about what we were eating. And what were we eating? Our trays included a fish complete with head, skin and bones – although we were encouraged “heado goodo” we were given dispensation to leave the head – some fabulous salmon sashimi, tightly curled fern tops, wasabi leaf with sesame, local vegetables in tempura, a superbly tasty clear miso soup and that future source of protein for all of us – grasshoppers. Yes we have both eaten grasshoppers with enjoyment and delight so we’ll be the survivors when the food runs out. We’ve now retired to plan tomorrow and blog but even with our own router there’s no signal deep down in the valley in the middle of town so we’ll have to go up to the cemetery in the morning to try to post and work out our route with Google maps or Navitime. Have you sussed they drive on the left yet? Most of the time yes, but on a couple of occasions coming out of convenience store parking I’ve lapsed because it feels so like America. No head-ons yet though. Previous Previous post: 12.04.2013 Murakami Day!